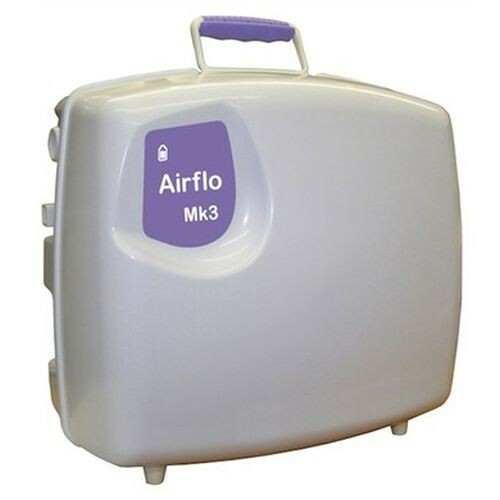 Mangar Airflo MK3 and Airflo Plus Compressors are battery operated. The batteries are easily recharged and spare batteries can be purchased as well, so you are always good to go. Both Mangar Airflo Compressors feature a battery level indicator light. This light lets you know when you need to recharge or replace the battery, so you are not stuck without power. The Mangar Airflo Mk3 compressor is designed to work with many Mangar products including the Surfer Bather. You can tell it is the Airflo Mk3 from the lilac handle, power supply and label. A hand control is included for easy adjustments by the patient or caregiver without having the compressor at hand. 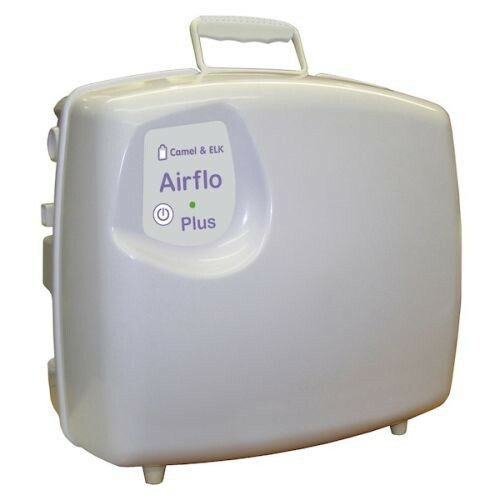 The Mangar Airflo Plus Compressor is more powerful than the Airlow Mk3 with a "high" air flow instead of just "normal" air flow. It also features an integrated "Auto" button. However, it does not come with a hand control. In addition, the high power makes this compressor louder and less suitable for bedroom or bathroom use. This high powered compressor can be identified by its gray handle, power supply and label and will work with Mangar's ELK and Camel devices. Vitality Medical carries additional batteries and other accessories for each compressor.